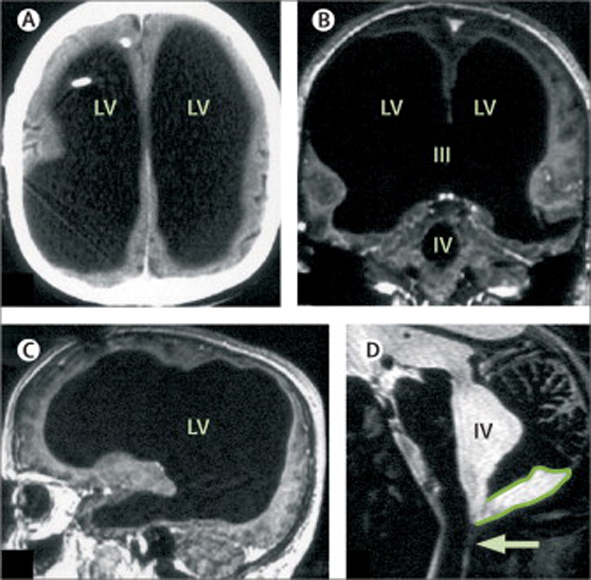 (A) CT; (B, C) T1-weighted MRI, with gadolinium contrast; (D) T2-weighted MRI. LV=lateral ventricle. III=third ventricle. IV=fourth ventricle. Arrow=Magendie’s foramen. The posterior fossa cyst is outlined in (D). A 44 year old man presented to the doctor with a weakness in his leg. ‘His neurological development and medical history were otherwise normal. He was a married father of two children, and worked as a civil servant.’ On CT scan they found an incredible brain that is mostly ventricles. Wild, how does that work?